Many pet bird owners risk the health of their birds by keeping them indoors all day long without any source of natural sunlight. 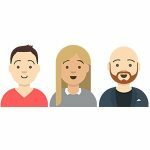 You might have heard in the news that many people are lacking vitamin D because they’re stuck inside an office. Well, the same is true for your pet birds which is why they need a proper source of natural light. Fortunately, bird cage lights and avian full spectrum lighting can provide this solution. When properly set up, a UV light will make your birds will be both happier and healthier. 3) How long should the bird light be on? Things to consider when buying parrot lights? Unfortunately, window filtered sunlight that most indoor birds see just doesn’t provide the full UV range needed to keep your bird healthy. It helps to synthesise vitamin D, which prevents vitamin D deficiency and low calcium levels which can cause weak bones and poor egg shell quality. Whilst you might think vitamin D supplements could fix this, the issue is that we don’t know how much each species of vitamin D a bird needs, so lighting provides a better solution. Makes your birds happier which reduces stress and then they’ll be less likely to develop problem behaviors and have a weakened immune system. Recreates a birds natural environment which helps with the birds body clock and aids with bird sleeping. Improves the vision of birds because they use the full spectrum for their vision. Many owner’s often note improvements in the feathers and plumage of the birds as these become stronger and brighter. From Wikipedia, the visual spectrum that birds can see. Full spectrum lighting provides the normal lighting that humans can see but also the full amount of UVA and UVA light that birds can also sense. This is necessary for recreating the effects of natural lighting and providing the full health benefits to pet birds. According to WildLifeRehabber.com, full spectrum is definied as a light which has a “CRI (color rendition index) of greater than 90, and a Color Temperature of >5000K”. Birds can see UVA light because they have 4 types of cones in their retinas whereas humans only have 3. It’s necessary for full spectrum lighting for parrots to include UVA light otherwise a bird isn’t be given it’s full visible range. 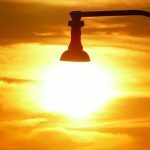 This form of UV light helps with the production of vitamin D. UVB light isn’t generated by normal light bulbs so specialist ones need to be used. Also, windows block UVB which is why artificial lighting is needed. How to safely setup a bird cage light? Most importantly, you want to angle your bird light to be above the cage of your bird. You do not want it to be sideways facing or beneath your pet. This is because otherwise the birds can stare into the light bulb causing blindness. You also want the distance of this bulb to be 12″ to 24″ away from the top of the cage. 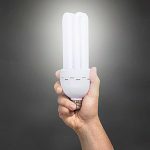 ParrotIslandInc.com recommends a the lights be kept 2 foot away when using strong or hot light bulbs. Too far away and the birds won’t feel the effect of the light and too close and they’ll have too much light. This is especially true if you have parrots which have strong beaks. You need to ensure that the lamp and any wires from it are not within reach of the bird. There is no firm answer to this question. According to the Arizona Exotic Animal Hospital, 10 to 12 hours of light is the normal amount of light you should provide your birds daily. 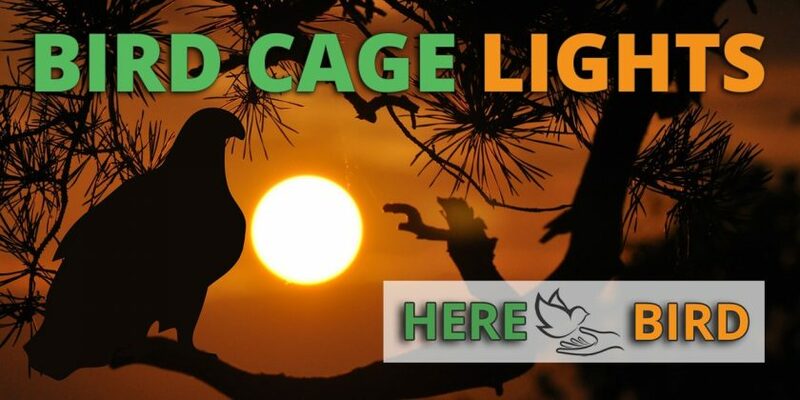 When first using the light you want to ensure that your birds are not being exposed to much of the light so keep an eye on the bird and how far it is positioned away from the cage. Once you and the bird are more familiar with the light then you can use a timer to set a regular schedule that mimics that amount of light they would be likely to receive in nature. 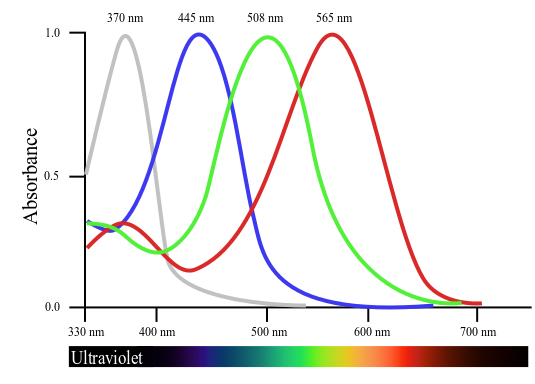 Light Spectrum – Does the light bulb provide full spectrum lighting along with both UVA and UVA? Price – Have much of a dent into your wallet is this going to cause? Safety – Is it easy to prevent your birds from touching and chewing the lamp or wires that the light comes with it? Building quality – Are the lights used from durable materials that are sturdy and will last or are they cheap and flimsy? Ease of setup – A good bird light design is simple, and can be installed, removed and repositioned with ease. Each bird cage light was examined by looking at factors such as the spectrum of lighting used, build quality, safety features and ease of use. By looking at these factors we managed to discover the best bird lights that are available and laid them out in the reviews below. Provides full spectrum lighting, just like in nature and doesn’t emit much heat. Easy to install using the nuts provided and works with both flat top and dome top cages. Wire extender to prevent birds from chewing the cable. Wire extender might might not be large enough for very large sized cages and so may need additional hanging to prevent it from hitting the cage. This is the best UV light available for birds. It’s easy to setup and use plus it’s made from quality materials so the lamp lasts a long time. Comes with top notch customer service if anything goes wrong. Ideal for parrots and other pet birds. Highly recommended. Brightness settings can be changed. Easy to angle using the goose neck design. Can be used by humans as well. Not built specifically for birds in mind, but can be still used with them if you have the correct light bulb. 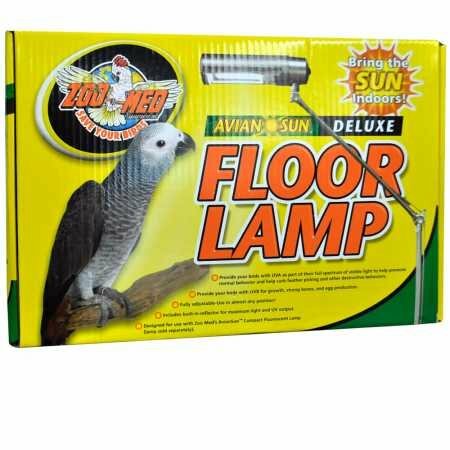 The height is not as easy to adjust as it is with the Avian Sun lamp (see below). This lamp is more aimed at humans than it is pet birds, but it still a suitable solution and can be used as a parrot light. Still requires a full spectrum light bulb to be purchased separately. Comes in a 5 foot or 6 foot version, depending upon the height of your cage. 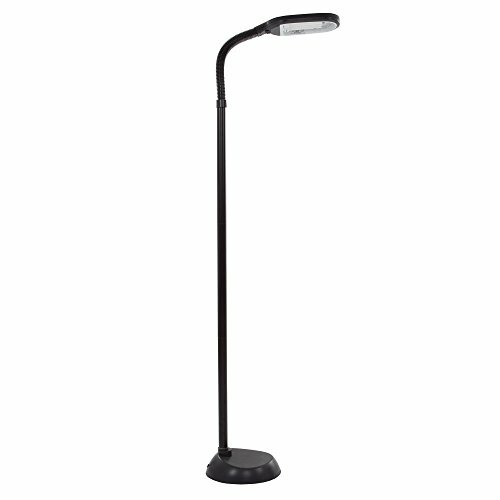 Effective and adjustable goose-neck design allows the light bulb to be positioned easily. Plenty of height so tall enough for most sized cages. Doesn’t give off much heat. Some customers have complained about the quality of the materials used. Other users have reported issues with the stability of the base but this may be due to incorrect setup. You can see how the floor lamp is set up properly in the manual provided here. The runner up but more affordable bird cage light, this is a better choice if you’re looking for a floor lamp based solution. Light bulb not included and has to be bought separately – we recommended one of the ones listed below. Any normal, correctly sized light bulb would work with the lamps listed above. However, normal light bulbs don’t provide the full spectrum of lighting that birds need to keep themselves healthy. Imagine a human working in a dimly light office cubicle with no windows vs someone working in an open plan office with a properly lighted room and big open windows. That’s why we recommend the light bulbs that have been specially designed for parrots and birds in general. These provide the full range of UVA and UVB light required and will make your birds happier. Also, another technology to look out for are led lights for bird cages, but currently there are not many of these available on the market that are built for pets. 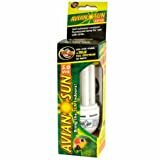 This 26 watt light bulb provides the full spectrum lighting (UVA and UVB) for your birds, allowing indoor birds to make that much needed vitamin D. The bulb will fit any light fixture of the same size and is screw based. 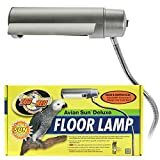 Is not included in the purchase of the Avian Sun Floor Lamp listed above so also needs to be purchased if buying one. 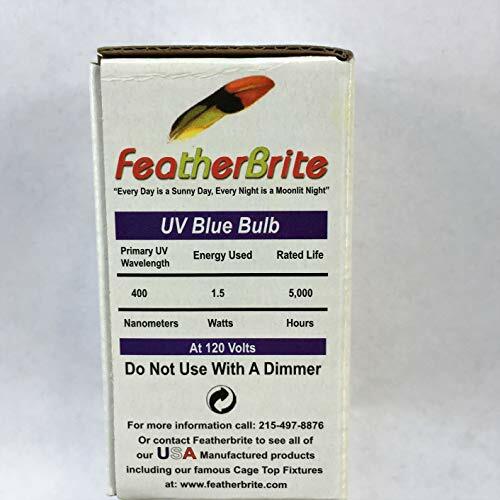 Different from a daytime light, this night time light bulb helps to prevent “night fright” that can happen in your birds. It provides a calming blue light that simulates the dim light of the moon. A good purchase for people that are experiencing problems with their birds having night terrors. Uses an LED bulb so is long lasting. Whilst any bird lighting setup requires both a bulb and a lamp, you also might want to consider using bird light timers to make managing your birds easier. 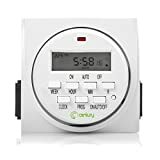 Turning your bird light on and off can be a hassle but with this timer you can do things automatically. Just make sure you have positioned the light correctly and are only using it for only the correct amount of time, as detailed in the above guide. How are your pet birds currently receiving full spectrum lighting? 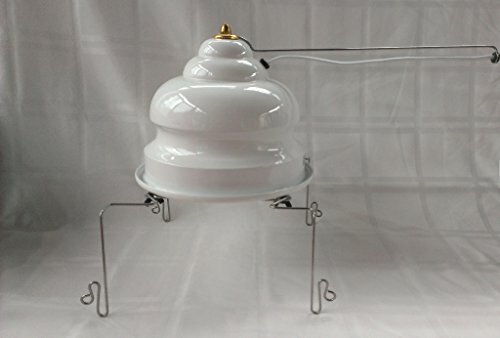 Overall, the best bird light that we came across is the Featherbrite Universal Light which easily rests upon the top of both flat and dome top based bird cages. 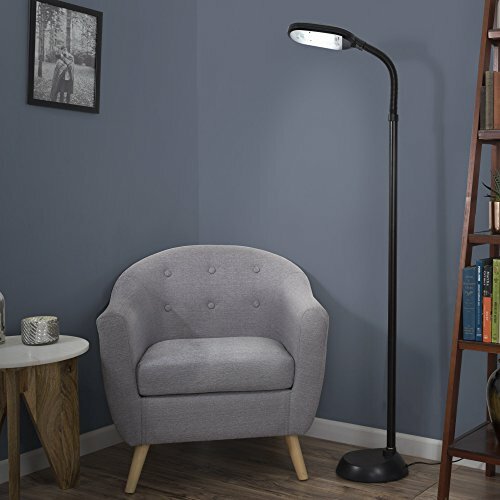 A runner up is the Avian Sun Floor Lamp from Zoo Med which offers a similar solution but comes as a ground based stand that offers a swivel neck adjustment – this gets the value for money award. 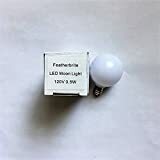 However, just as a important as the lamps and maybe even more so are the light bulbs used and for this we recommend using the Featherbrite bulbs. Thank you, thank you, thank you. Got mired in articles and sales sites, then lost all that info and started again. Then just came here. THANK YOU. Thanks Susan. Glad you found the article useful!